Finding "the first" instance of something is often very difficult, if not impossible. Not so much for going through and doing research, but more because almost everything has an antecedent of some sort. Which isn't to suggest it's not worth looking, but that what is sometimes cited as "the first" maybe isn't. In the strip, the Kids are up to their usual antics, resulting in Uncle Heinie taking a long fall. He gets up, seemingly not severely hurt, and begins cursing using a star, an anchor, two exclamation points, a question mark, and some kind of blobby thing that never seemed to have printed very well. 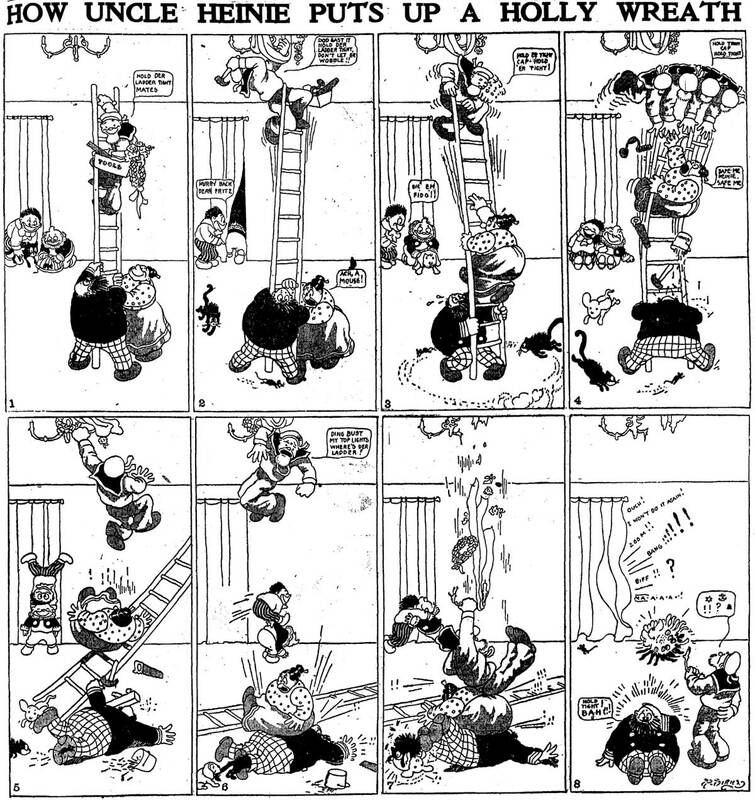 The idea seems to have caught on fellow cartoonist Gene Carr used the idea repeatedly throughout 1903. Everybody seems to make note that the anchor is unusually appropriate to signify that Uncle Heinie is "swearing like a sailor"
Calling out that anchor isn't totally illogical, but the fact that Uncle Heine is a sailor and clearly dressed as one could just as readily suggest that the anchor is simply a graphic appropriate for his occupation. Had he been a fire fighter, maybe Dirks might have drawn a flame. Had he been a blacksmith, maybe Dirks might have drawn an anvil. I can't seem to find an origin for the specific phrase "swear like a sailor" but the idea dates to at least a century earlier. Sea captain Charles Tyng wrote in his biography that he "listened with horror to the profane language of the sailors" when he first went to sea in the early 1800s. But, again, since Uncle Heinie is already clearly identified as a sailor, the anchor might just well be a reinforcement of that idea. 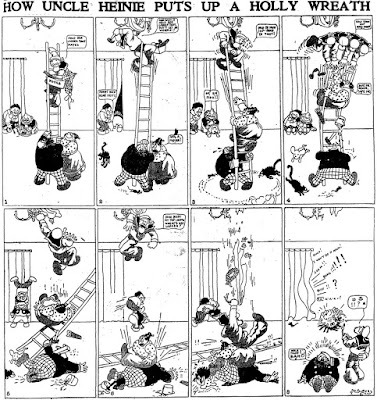 Much the same way as each panel in the strip is individually numbered, the language of comics at the time still tended to favor the blindly obvious. Interestingly, I found multiple articles on the topic of the first grawlix attributed to Ben Zimmer. He seems to have discovered this particular strip in 2010 and repeats some of this information in other articles, including the "swearing like a sailor" observation. Other articles on the topic seem to reference back to Zimmerman's work, either directly or indirectly, and I can't find any written prior to 2010. I'm not saying Zimmer is wrong here in his identification of Dirks being the first to use a grawlix, but I'm not seeing anyone who's done their own research. Everyone seems to have just assumed Zimmer's work is definitive. And he may well be correct, but I'd be interested to see if anybody else has been able to corroborate or disprove his findings.